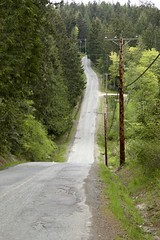 We had a wonderful weekend on Salt Spring Island. Kristi spent last week there co-facilitating the review of the islands official development plan. I arrived on friday just as all the final presentations were taking place. My first impression of the large and engaged crowd was that they’d best put their efforts into seniors housing and graveyard planning, given the median age was about 70. Nonetheless, they were bright-eyed and healthy-looking, and not quite ready for the boneyard yet, but it was obvious that demographics are a concern for the island’s future. Land is simply too expensive for young folks to afford, it seems, plus there may not be that many interested in a rural life. We spent saturday exploring the island. The Ganges market was on, and there were many beads and baubles for sale to appease the most discerning hippie. There were also fantastic breads and local cheeses and pea greens and potstickers and fudge and baked goods. Yum. I had a great coffee at the Saltspring Island Coffee Co.
We enjoyed Salt Spring’s pastoral beauty on a driving tour of the island, then we camped in Ruckle Park, right on the water. 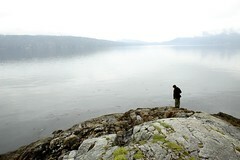 It was great to hear the waves splashing on the shore, and got me excited for our trip to the West Coast Trail in July. The rain pitter-pattered on our tent in the night, and yesterday was more soggy and grey, but we still enjoyed ourselves. We went on a great walk in Bourgogne Park among mossy boulders, arbutus and a gorgeous large stand of Garry Oak. 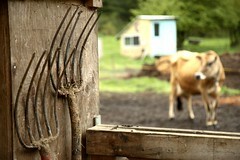 We also visited the Moonstruck Organic Cheese farmstead (http://www.moonstruckcheese.com/), where they produce the most delicous cheese I’ve had since I was in France. We conversed with the delightful jersey cows who deliver the milk for the cheese. We caught the mid-afternoon ferry home, via Victoria, and ran into Debou on the home run. He’s just got a part-time job driving a whale-watching boat, and is very excited about that. He’d lost two of his roommates somewhere on the ferry, though. Kristi is making great headway on her knitted bag (she’s knits unconsciously now, and can look around while she’s doing it). I’ve started reading 1491 and Everything is Illuminated, which does a great job of butchering the english language. 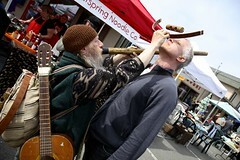 Just a word of note, the gentleman with the amazing twirling stick you experienced on Saltspring is one Palu Rainbowsong. I grew up there.. wouldn’t be the same without him.